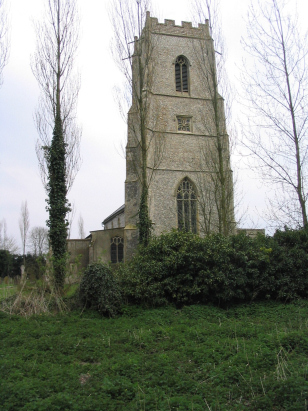 The parish of Wood Dalling lies in central Norfolk tucked away in the lanes to the north of the small market town of Reepham. There is little in the way of a nucleated village, there is simply a collection of cottages and farms loosely spread over a largely flat plateau. In the west of the parish lies the eponymous Hall which is probably reflective of the parish as being a "closed" parish with entry restricted by land ownership. St Andrew's church lies at what might be deemed to be the centre of the parish, a complex intersection of lanes hosting a group of cottages. 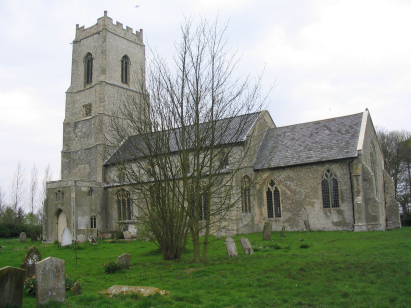 The church is a mixture of ages with parts dating from the early 13th century through to the late 15th. As a consequence there is also a mixture of architectural styles with Perpendicular sitting alongside Decorated. The stately western tower also shows signs of having been extended and repaired numerous times over the centuries. A single standard 800-entry register book is the sole deposit covering the period of the transcript. Regrettably this ends at July 1877 leaving a gap covered by an as yet undeposited register. Sadly there are also no extant Bishops Transcripts to complete the gap so this transcript is incomplete. The deposited register is filmed on Microfilm MFRO 389 in the collection of the Norfolk Record Office and from which this transcript was prepared. This film is a re-filming of the original microfiche and fairly recent, as a consequence the images are an improvement and are sharp and contrasting. As a consequence this was a fairly straightforward transcript to prepare and it is to be hoped few errors will have crept into its production. If the remaining 29 month gap is filled in future by further deposits then these records will be added when available.